If a team isn't in the playoff hunt by this time of the season, they're making preparations for the next one. Call-ups from the farm team will be made, free agents from the NCAA will be signed and players from major junior will turn pro. The final 10 games are an audition, and hopefully the new faces make enough of an impression to be remembered when training camp opens this fall. Last year, Casey Mittelstadt played six games and scored five points in the final month, providing an opportunity for fantasy owners to add some upside for the stretch drive. Here's the breakdown of players who may see more playing time down the stretch. He's a bottom-pairing defenseman on a loaded Flames blue line, but Andersson is earning a lot of Bill Peters' trust, and that will be important come playoff time. He averaged less than 16 minutes per game to start the season, but after scoring four points in January his ice time started to really creep up, and entering Sunday is now averaging closer to 18. He quarterbacks the second power-play unit, a job originally given to Noah Hanifin and T.J. Brodie at the start of the season. He's been excellent lately with four goals in his last three games, and one of the few bright spots in the Stars' brutal campaign. 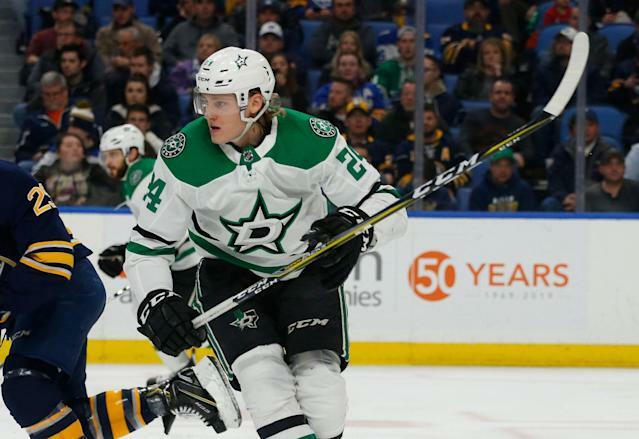 The 2015 second-round pick has exceeded expectations and plays on the top line with Tyler Seguin and Alexander Radulov, taking Jamie Benn's spot and giving them a little more balance. Hintz has played at least 16 minutes in four consecutive games after averaging just 12 through the first four months of the season, and like Benn, Hintz possesses that rare mix of size and skill. If Jim Montgomery continues to trust Hintz, he could play a big role in the fantasy playoffs. The spotlight was on forward Ryan Kuffner, who made his Red Wings debut Saturday after four years at Princeton, but he played just 7:08, nearly two minutes of which were on the power play. It's unlikely he'll get much more ice time, so the player to keep watching is Hronek, who skated 24 minutes and now handles the team's top power play. It's his job to lose now, and he'll be more important than veterans Mike Green, Jonathan Ericsson and Trevor Daley, none of whom have any good reason to hurry back from injury. He's the most highly-touted Canucks defenseman to come through their pipeline, but his season debut will have to wait until he's completely healthy. When Hughes does play, expect him to get a pretty big workload right away as the Canucks throw their top prospect into the fire, and he'll definitely get power-play time, even if it's with the second unit. Hughes can be a game-changing player, but he does so taking considerable risks with the puck, so the Canucks will have to live with both the good and the bad. In the meantime, Nikolay Goldobin, in his contract year, is getting a lot of opportunities on Bo Horvat's left wing with Antoine Roussel out for the season and Sven Baertschi's return uncertain. A third-round pick from 2015, Montembeault has dutifully paid his dues in the AHL, accumulating 78 career starts and playing well for an average team. But with a win last night, Montembeault is now 4-0-1 to begin his NHL career, giving the Panthers some confidence he can be the heir to Roberto Luongo's (porcelain) throne. The Panthers would be silly not to keep riding the hot hand, so expect Montembeault to get more starts. With their AHL team out of playoff contention, it'll be interesting to see how the Panthers handle their goalie situation, though it's possible they simply just carry three goalies the rest of the season. Even the most ardent defenders of Nylander have to admit it's a little worrying that he had just one shot in two games with the Sabres — both shutout losses — and he still hasn't shown any signs of being an elite scorer. Sure, he has improved, but in three pro seasons he hasn't taken that big step forward many of his talented peers do. The good news is he's still signed through 2021, so the Sabres can afford to be patient. Nylander is a top-six winger on the Sabres almost by default with their lack of quality depth, but don't expect too much. If the Blackhawks can get Sikura going, their offense might be their best ever in the Toews and Kane era. Alex DeBrincat and Dylan Strome have proven themselves, and if Sikura, a two-time 50-point scorer for the Northeastern Huskies, finds a way to become an effective scorer in the NHL, they'll have three solid lines that can score. It helps that head coach Jeremy Colliton also coached him in the AHL, and although Sikura will have to earn his ice time, it's noteworthy he led the Blackhawks in shots with four Saturday against the Habs despite skating just 11 minutes, and at times played on the top line with Jonathan Toews. There's no question the Ducks need to move on. Ryan Kesler's completely done as a top-six (maybe even top-nine) center, so the future is now. The player with the most upside is clearly Terry, an all-around offensive winger who was a point-per-game player in the AHL this season as a rookie and clearly possesses top-six upside, more so than Daniel Sprong or Max Jones. Terry's ice time yo-yo's game to game, but with back-to-back three-point games in early March, he's clearly an explosive talent. Terry gets the A-plus assignment skating next to Ryan Getzlaf. If any player is going to have that Mittelstadt-type impact down the stretch, Maximilian is your best bet. Signed as an undrafted free agent, the local kid was slotted onto the top line right away with Brady Tkachuk and Jean-Gabriel Pageau, and for the second straight game looked very much like he belonged in the NHL. He collected his first point, a secondary assist after gaining the zone on Cody Ceci's goal, and registered two shots in 15 minutes of ice time. The sample size is small, and Veronneau is an older rookie and the track record for these kinds of players hasn't always been good, but Guy Boucher was just fired for not playing the younger players; Veronneau’s going to play a lot no matter what.